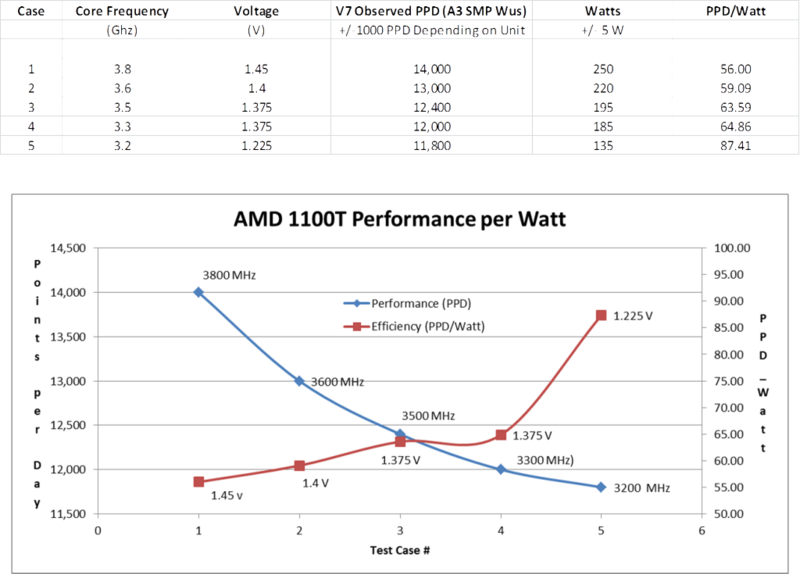 After reading my last post about the AMD Phenom II X6 1100T’s performance and efficiency, you might be wondering if anything can be done to further improve this system’s energy efficiency. The answer is yes, of course! The 1100T is the top-end Phenom II processor, and is unlocked to allow tweaking to your heart’s content. Normal people push these processors higher in frequency, which causes them to need more voltage and use more power. While that is a valid tactic for gaining more raw points per day, I wondered if the extra points would be offset by a non-proportional increase in power consumption. How is efficiency related to clock speed and voltage? My aim here is to show you how you can improve your PPD/Watt by adjusting these settings. By increasing the efficiency of your processor, you can reduce the guilt you feel about killing the planet with your cancer-fighting computer. Note that the following method can be applied to any CPU/motherboard combo that allows you to adjust clock frequencies and voltages in the BIOS. 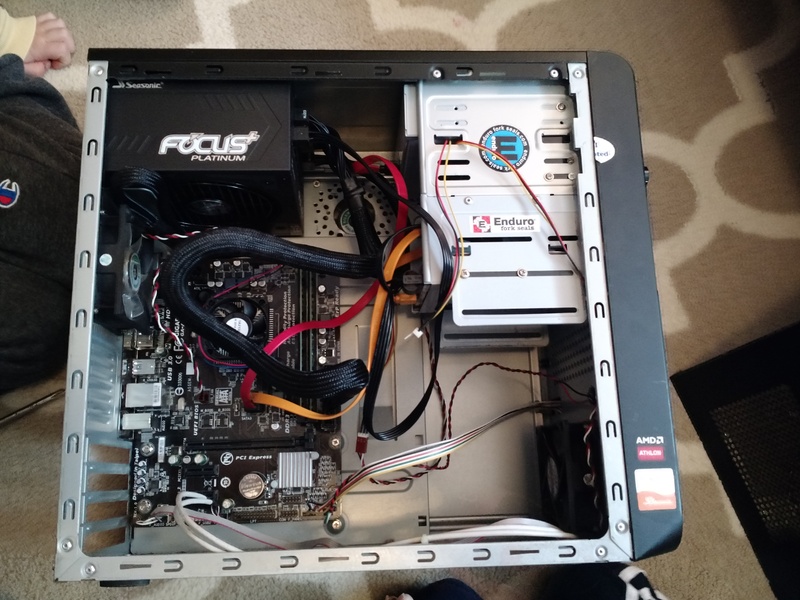 If you built your folding rig from scratch, you are in luck, because most custom PCs allow this sort of BIOS fun. If you are using your dad’s stock Dell, you’re probably out of luck. 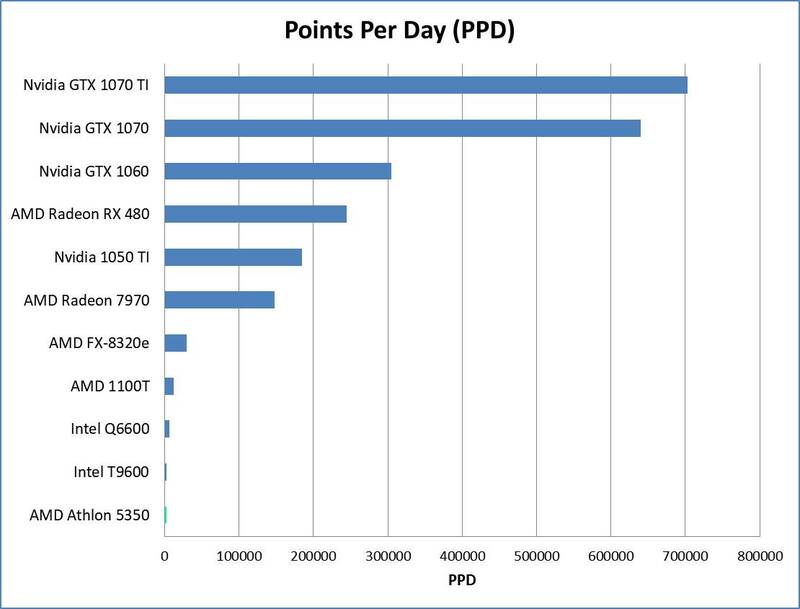 The baseline stats for the X6 Phenom 1100T are 3.3 GHz core speed with 2000 MHz HyperTransport and Northbridge clocks. 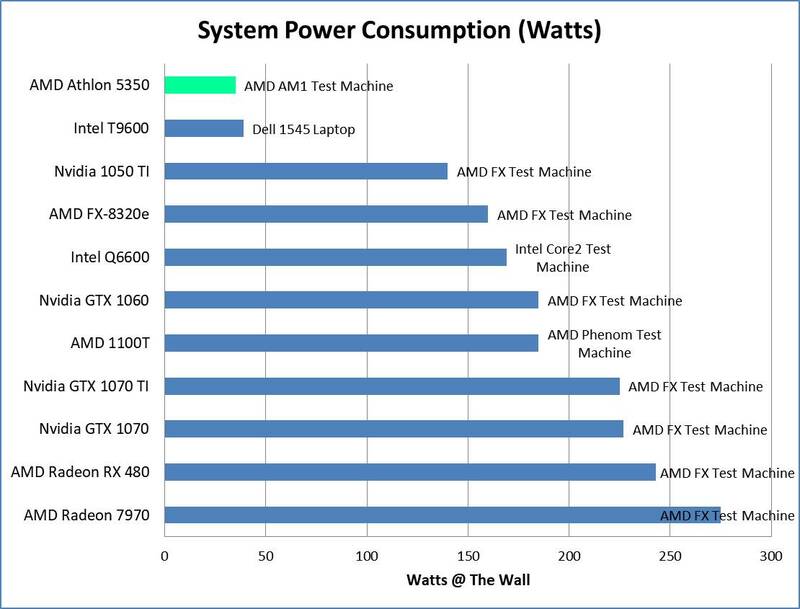 This is achieved with the CPU operating at 1.375v, with a rated TDP (max power consumption) of 125 watts. Running the V7 Client in SMP-6 with my pass key, I saw roughly 12K ppd on A3 work units. This is what was documented in my blog post from last time. Now for the fun part. Since this is a Black Edition processor from AMD, the voltages, base frequencies, and multipliers are all adjustable in the system BIOS (assuming your motherboard isn’t a piece of junk). So, off I went to tweak the numbers. I let the system “soak” at each setting in order to establish a consistent PPD baseline. I got my PPD numbers by verifying what the client was reporting with the online statistics reporting. Wattage numbers come from my trusty P3 Kill-A-Watt meter. First, I tried overclocking the processor. I upped the voltage as necessary to keep it stable (stable = folding overnight with no errors in F@H or my standard benchmark tests). 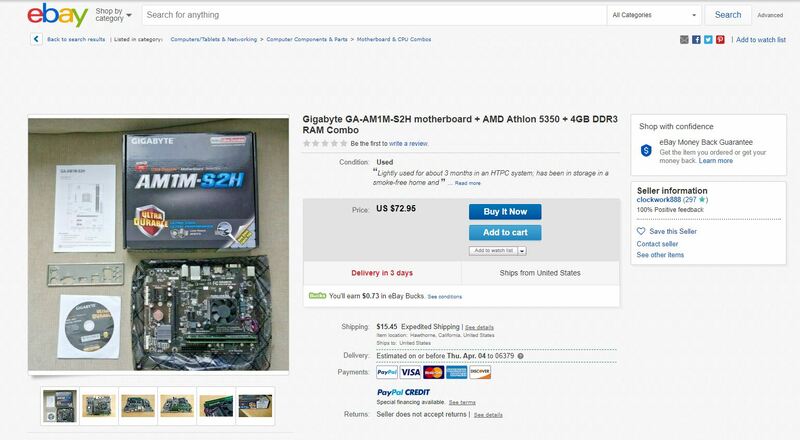 It was soon clear that from an efficiency standpoint, overclocking wasn’t really the way to go. So, then I went the other way, and took a bit of clock speed and voltage out. These results are very interesting. Overclocking does indeed produce more points per day, but to go to higher frequencies required so much voltage that the power consumption went up even more, resulting in reduced efficiency. However, a slight sacrifice of raw PPD performance allowed the 1100T to be stable at 1.225 volts, which caused a marked improvement in efficiency. With a little more experimenting on the underclocking / undervolting side of things, I bet I could have got this CPU to almost 100 PPD / Watt! 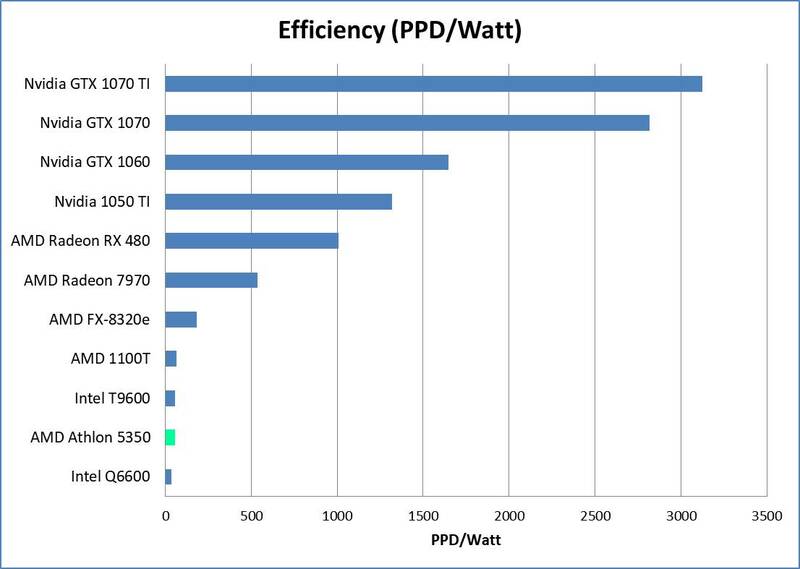 PPD/Watt efficiency went up by about 30% for the Phenom II X6 1100T, just by tweaking some settings in the BIOS. Optimizing core speed and voltage for efficiency should work for any CPU (or even graphics card, if your card has adjustable voltage). If you care about the planet, try undervolting / underclocking your hardware slightly. It will run cooler, quieter, and will likely last longer, in addition to doing more science for a given amount of electricity.